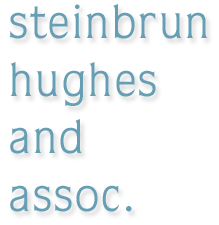 Steinbrun Hughes offers retained search and consulting solutions, placing senior level executives in mission-critical roles. With experience in numerous industries, our clients range from high-growth early stage/ middle market companies and the funds that invest in them to Fortune 50 enterprises. We partner to make excellent strategic hiring decisions for your organization. Most of our work comes from referral or repeat business. Our results are the reason that we are retained again and again by our clients. 2010 © Steinbrun Hughes & Associates. All Rights Reserved.